Looking for a job can be a daunting task, but getting your resume completed is often the hardest step. Since your resume and cover letter are usually the first things a prospective employer sees from you, it's important to get them right. Should you use bullets or dashes? Is okay to justify your paragraphs? What about page formatting? For some ideas and inspiration, check out the resume and cover letter templates available in the Google Docs templates gallery. Have you ever wondered about planets orbiting stars that are outside our solar system? 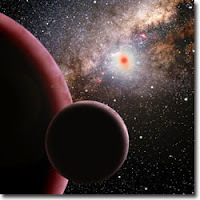 They are called “exoplanets” and more than 300 have been discovered by astronomers worldwide since the late 1990s. You can now explore these “strange new worlds" using Google Earth's API. Our blogging resolution - we want to hear from you! We hope you all enjoyed your holidays, semester breaks, and time off. We have a lot in store for the Google Student Blog in 2009 but we'd also love to hear from you about what you'd like to see in these posts. You can think of it as our New Year blogging resolution. Have a great idea for a post or a series? Is there something you're dying to learn more about? Want to guest write a blog to share how you use Google products on your campus? Share in the comments below or email us at studentspeak@google.com. We look forward to hearing your ideas and making sure your voices are heard.